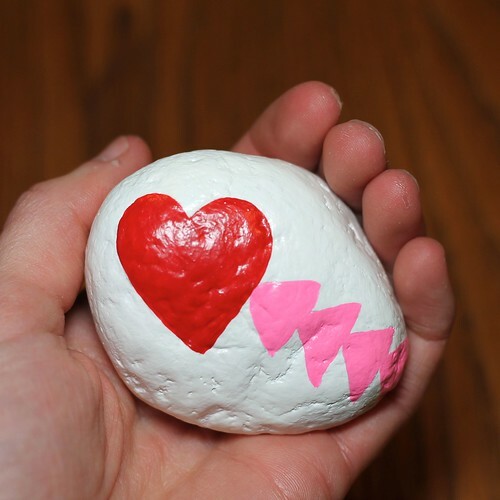 Do you need to make a quick little Valentine's Day gift or do you (like me) just need a good paper weight to hold down all of those valentines from your countless secret admirers? (Ha ha, just kidding. But seriously.) Well, you could slap a heart on a rock! And by "slap" I mean "paint." Better yet, what about using a heart shaped rock?! this is cute and useful!!!! Yes, rock painting is fun! I see you got your beloved triangular shapes in to point to that read heart! My project still needs to be finished with tiny details and then a coat of matte varnish. I'm just waiting for my little craft helper to come again!